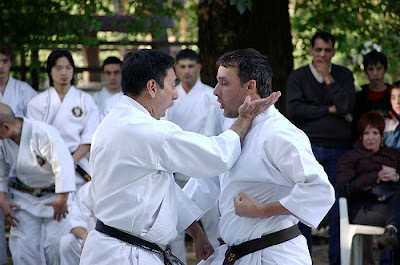 There has always been, and always will be controversy about whether kata is vital or useless in martial arts practice. I like kata as a training method and consider it vital, but I'll readily admit that if it does have a problem, it is that done repititiously and mindlessly, kata rapidly becomes stale. You have to have kata practice, but not all of it should be kata-mode. At least some of your kata practice should include creative variation. Here is a good method to introduce some variability and some creativity to an otherwise stale kata practice. It is called the SCAMPER method. S - Substitute. Try swapping logical moves in and out. For instance, anywhere there is a lunge punch, try a triple-punch or a frontkick-lunge punch combo. It will put you in the same position ready to continue the kata but it will break up some of the stagnation in your mind and give you some new ideas. C - Combine. Try combining 2-3 movements in a different way or try changing the timing between a couple of the movements of the kata. A - Add. Try dropping a piece of another kata right in the middle of this one, then continuing where you left off. Practice your goshinjutsu (self-defense techniques) with your partner attacking you in the middle of a kata. Perform the goshinjutsu and then pick back where you left off on the kata. M - Maximize or minimize. Make your steps and motions as large or as small as possible. Maximize or minimize the importance of any particular movement. Try tying an arm to your belt to minimize the movement on that side. P - Put to another use. Reimagine obvious uses of movements. Something that you're sure is a lunge punch, figure out how it could be a grappling move. Something you're sure is a grappling move, reimagine as a pressure point technique. E - Eliminate. Eliminate large chunks of the kata, reducing the remainder to a short drill that you can repeat many times in a short space. Eliminate extra weight shifts. Eliminate chambering punches. See what you end up with. R - Rearrange or reverse. What if the order of the movements in the kata is not gospel? What if you step back here instead of forward? What if you turn left here instead of right? What if he grabs you in response to your punching him instead of you punching him because he grabbed you? Whenever you get so accustomed to your kata that it starts getting tiresome, and you're sure that you have THE one and only correct bunkai that was handed down from God to the ancestors, try SCAMPERING the kata and you'll literally find a lifetime of study in any one kata (Remember Funakoshi even called Taikyoku, "The Universal kata").